Welcome to my Print Shop. My handmade prints are all original prints meaning that the whole process of their production is done by me, the artist. I create the design, cut the blocks then ink up and print them using my excellent Rollaco press or sometimes just the back of a wooden spoon. 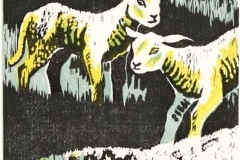 The colours and textures of each print may vary slightly within a print run because of this; a digital printing machine would produce identical reproductions but I cannot and this is all part of the charm and identity of hand produced prints. The prints shown here can be ordered online and paid for by card or cheque, just go through the check-out. I will aim to send your order out as soon as possible but please allow 7 working days or, if paying by cheque, 14 working days as the cheque will need to clear first. Note that the payment gateway uses the American spelling: “check”. Please contact me if you have any queries or would prefer to pay by bank transfer. All prices include p & p within the UK (contact me for prices outside the UK). Most of my prints come ready mounted and these I will send flat-packed but there are a few just too big to be safely sent this way. In these cases I will roll them carefully between acid free tissue paper and send in a sturdy cardboard tube. £40 Woodcut, linocut and stencils on acid free cartridge paper, edition of 5. Image size: w37cm x h42cm Unmounted – will be sent in a tube. 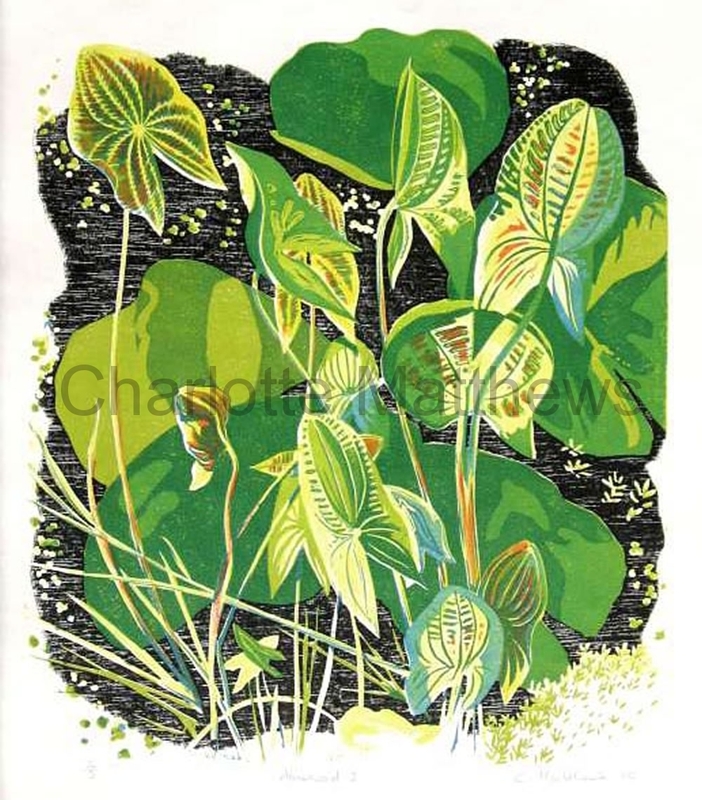 Based on a drawing of the Arrowhead plant growing in my garden pond, I simply enjoyed re-creating the shapes, patterns and textures in this print. I made a very small edition of 5 in green and another of 4 in red. £40 Woodcut, linocut and stencils on acid free cartridge paper, edition of 4. Image size: w37cm x h42cm Unmounted – will be sent in a tube. 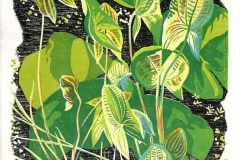 Based on a drawing of the Arrowhead plant growing in my garden pond, I simply enjoyed re-creating the shapes, patterns and textures in this print. I made a very small edition of 5 in green and another of 4 in red. £55 Linocut with monoprint on imitation Japanese paper, edition of 50. Image size: w17.5cm x h18cm Mounted size: w29.6cm x h31cm Belle Tout Lighthouse is a popular landmark standing high on the chalk cliffs near Eastbourne. The scrubby downland below is home to local bird life like these Goldfinches and provides a resting place for migrant birds newly arrived from the Continent. Birders often gather here too in the hope of spotting a rarity. 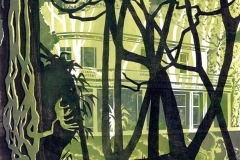 £75 Woodcut and card relief printed on acid free cartridge paper, edition of 25. 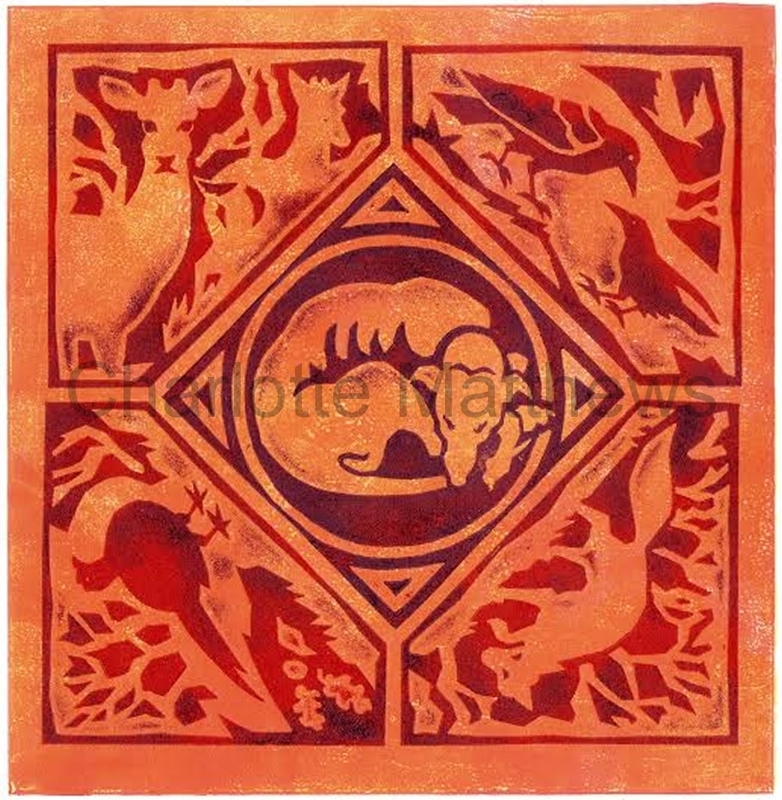 Image size: w21.8cm x h55.7cm Unmounted – will be sent in a tube. 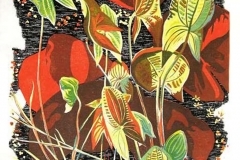 The block for this print was cut from an old piece of pine floor board. Hard work but I like the fact that the natural wood grain shows through. The Dorset ewe in the foreground and mothers with lambs were drawn from life at Middle Farm in Firle where I worked at the time. The subtle colours behind the main block (or ‘key’ block) were printed first from two relief blocks made from thick card. 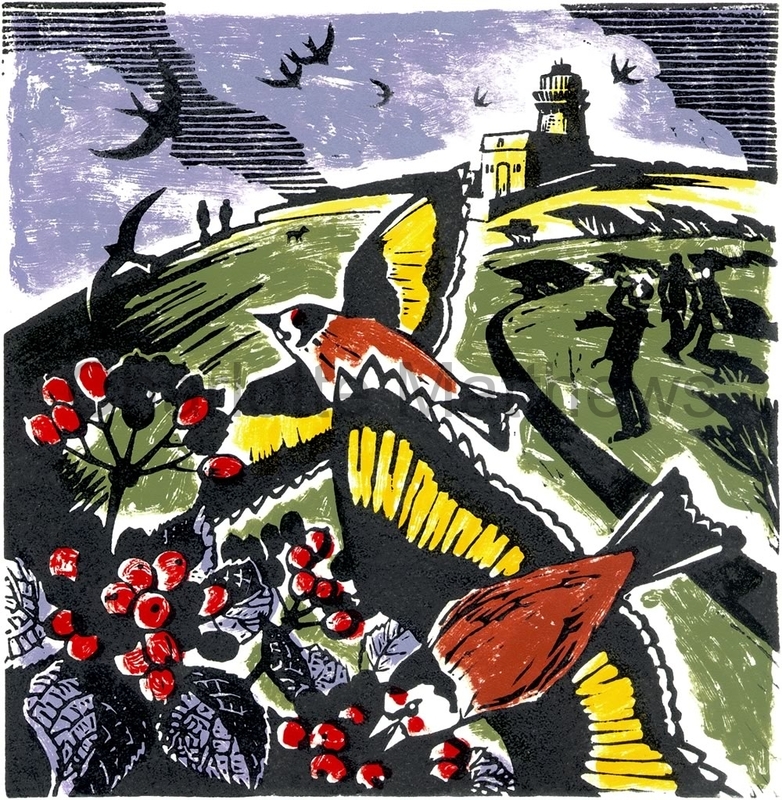 £80 Linocut and monoprint on Fabriano Artistico paper, edition of 20. 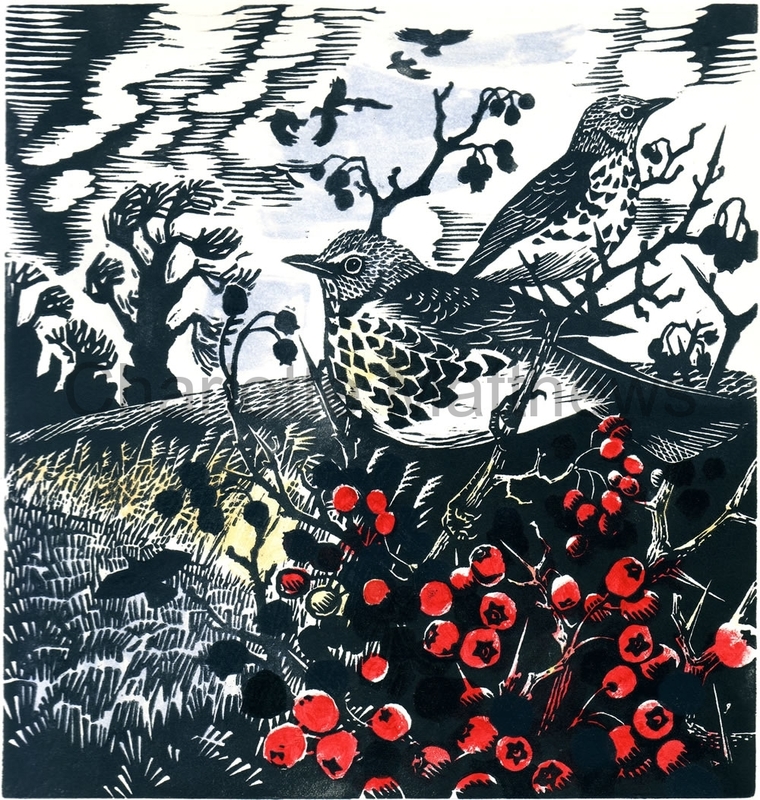 Image size: w22cm x h23.5cm Mounted size: w35.5cm x h38cm These winter visitors feed up on hedgerow berries at Court Lodge Farm in Wartling. 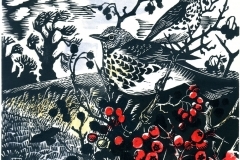 The owners of this organic farm actively encourage wildlife and the image was made for the 2008 Court Lodge Farm calendar in celebration of some of the creatures found there. SOLD OUT Relief print from cut card printed on Fabriano Artistico paper, edition of 14. Image size: w21.3cm x h21.8cm Mounted size: w34.3cm x h36.5cm The simple beauty of Medieval tiles led to this image. My ‘tile’ shows a lurcher sleeping contentedly in the centre surrounded by creatures that she encounters day to day. The materials used to make the blocks were readily available and inexpensive – just an old cereal packet carefully cut with a scalpel, glued down and varnished. 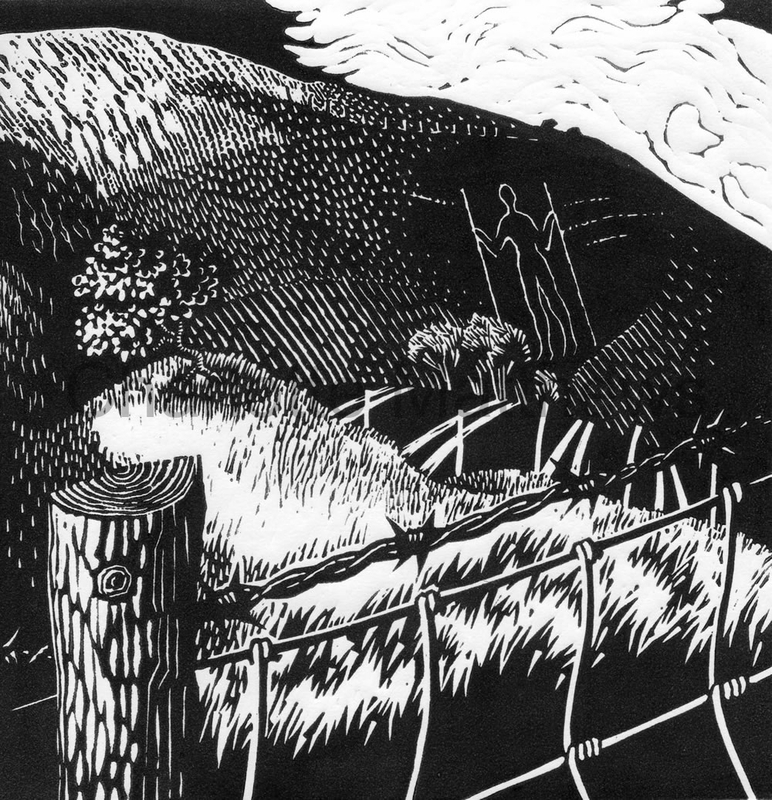 £28 Woodcut printed on Fabriano Artistico paper, open edition (unnumbered). 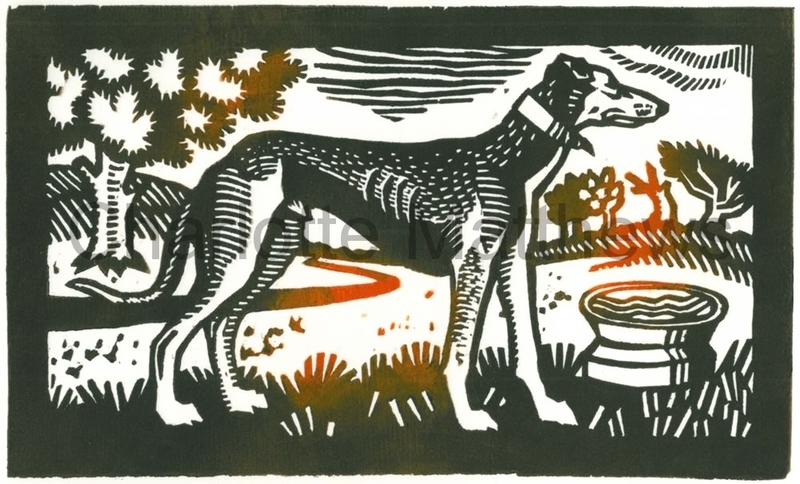 Image size: w19.8cm x h12cm Mounted size: w33cm x h26cm This woodcut portrait shows saluki/greyhound cross, Joe. 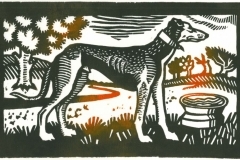 It is a Medieval style print of the sort of hunting dog much prized in those times. 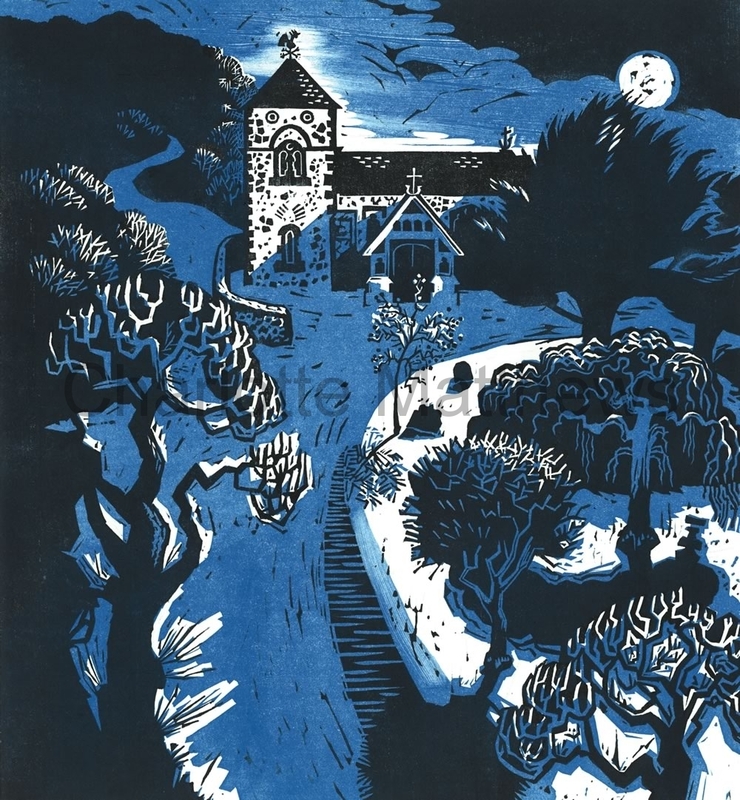 £80 Linocut printed on Fabriano Artistico paper, edition of 20 Image size: w27cm x h29.5cm Mounted size: w41cm x h45cm St Andrew’s Church, Jevington in wintery mood. The unusual weeping Wych Elm was planted to mark the end of the 1st World War. 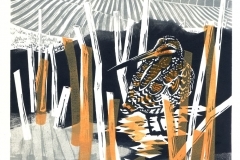 £75 Woodcut + collagraph printed on Fabriano Artistico paper, edition of 20. Image size: w25cm x h34.3cm Unmounted – will be sent in a tube. 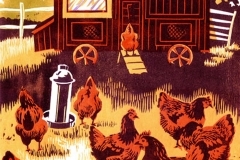 The Sussex breed of hen comes in a variety of colours. 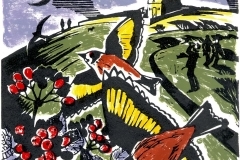 Friends in the village bred the Red Sussex and I spent a sunny October morning observing and drawing them in preparation for this woodcut. 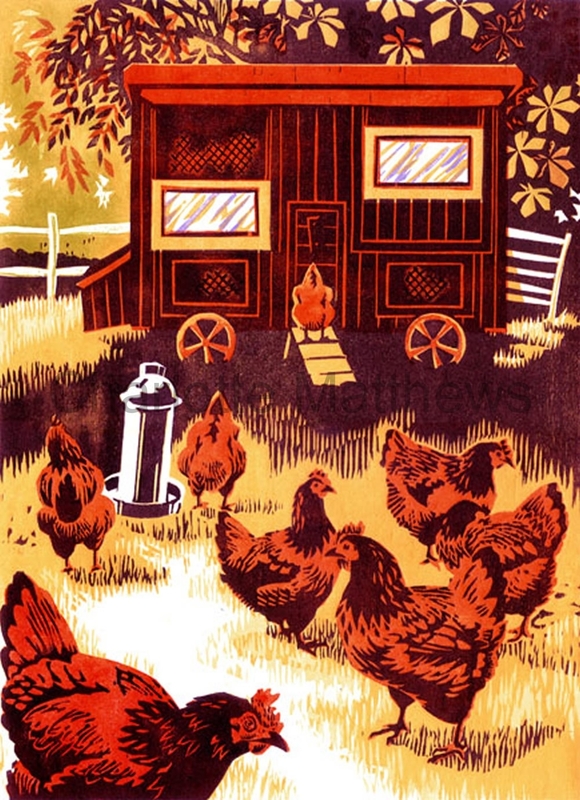 £80 Linocut with stencils printed on tinted acid free cartridge paper, edition of 16. 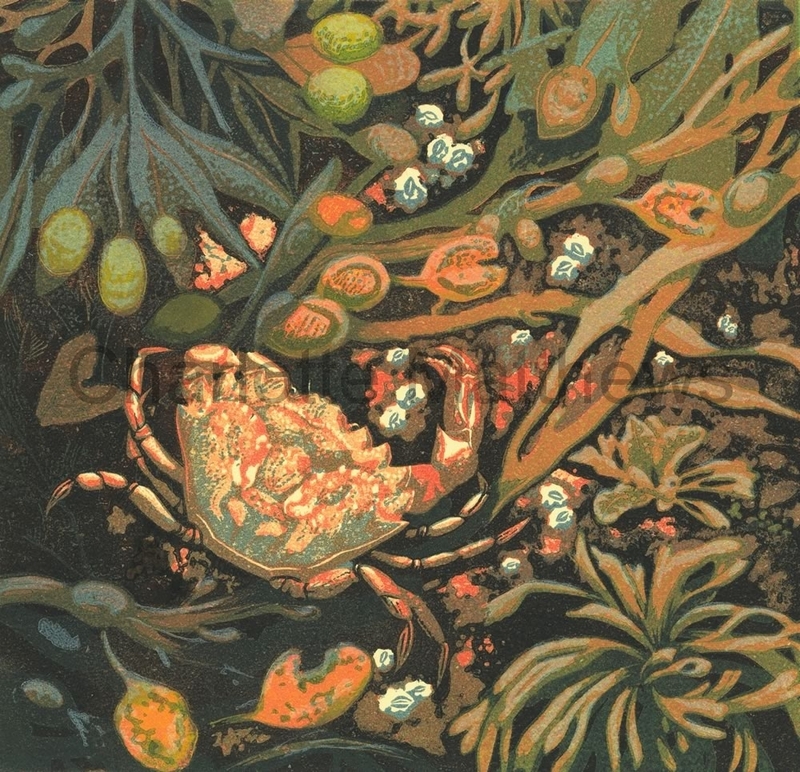 Image size: w28cm x h27cm Mounted size: w43cm x h44cm I can spend hours beachcombing and exploring rockpools. I found these seaweeds on South Uist in the Outer Hebrides. 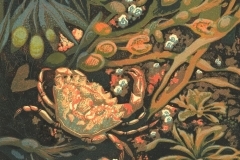 The Shore Crab was more local, found on the Sussex shoreline. 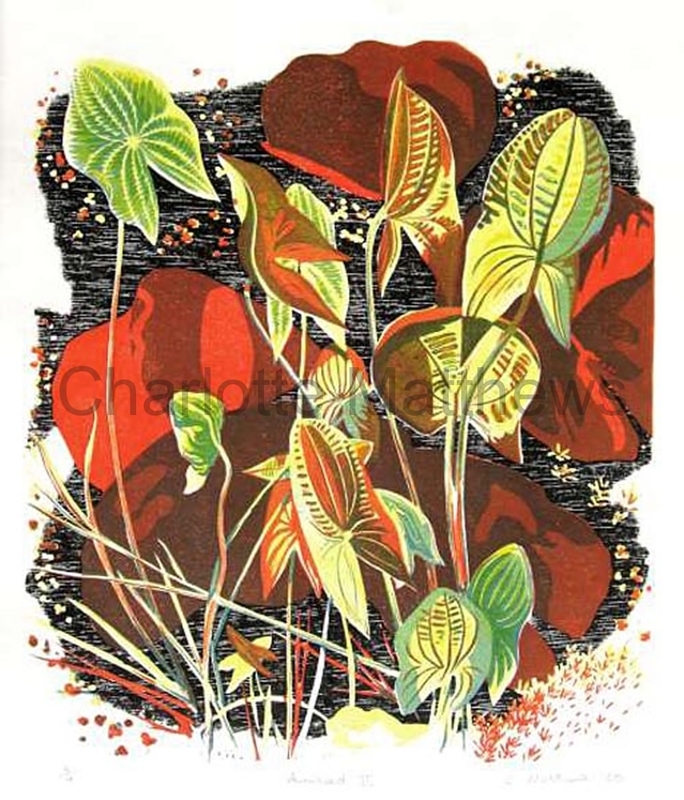 I enjoyed re-creating the shapes, textures and patterns of these natural finds in this linocut. 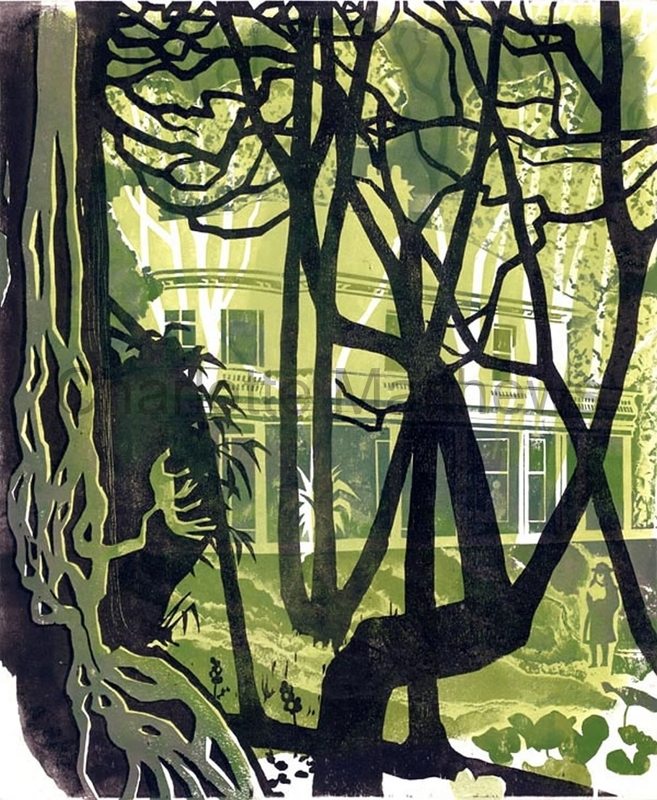 £80 Linocut printed on Artistico Fabriano paper, edition of 20. 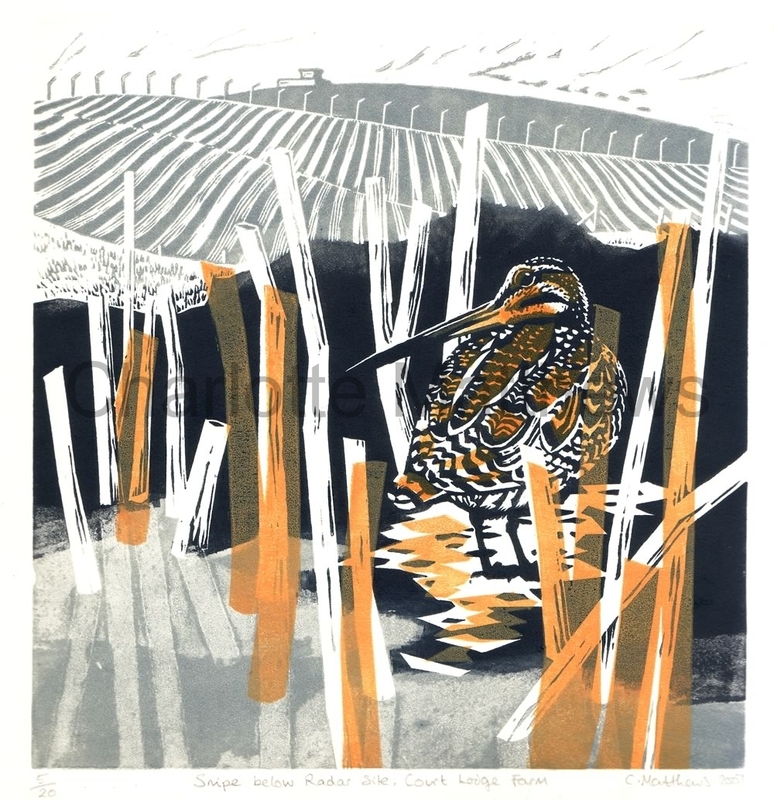 Image size: w22.5cm x h23.3cm Mounted size: w35.5cm x h38cm Court Lodge Farm has plenty of good Snipe habitat as part of the land extends on to the Pevensey marshes. The farm is organic and as a result is a haven for wildlife. 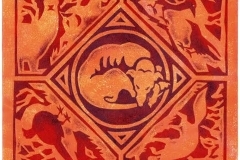 This image was one of six used in the farm’s 2008 calendar highlighting some of the creatures found there. The strange building on the brow of the hill is an old war time radar station, now a private residence. 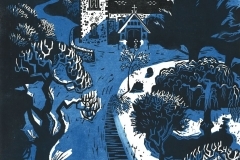 £50 Linocut printed on imitation Japanese paper, edition of 50. 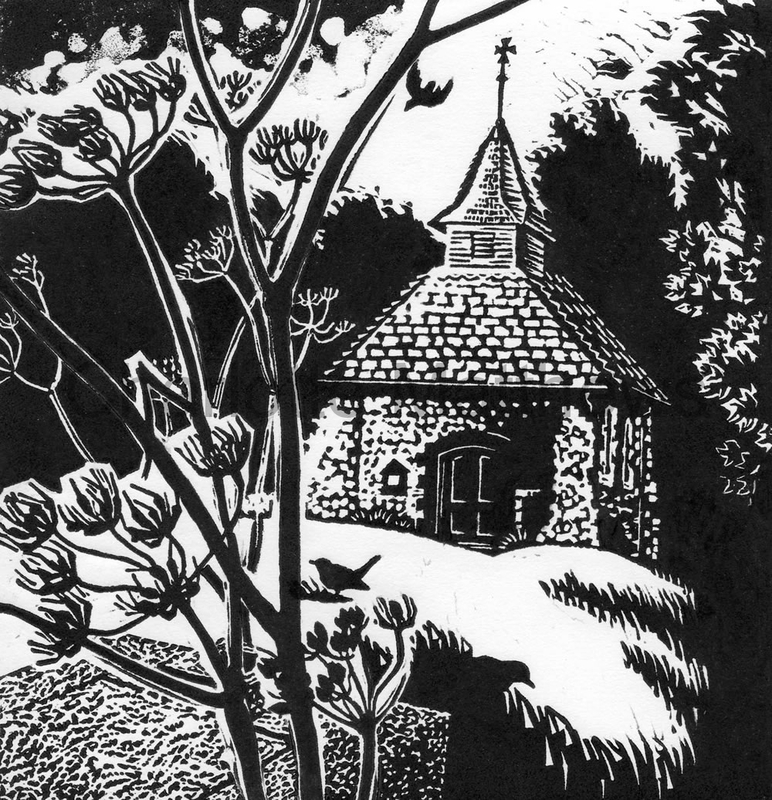 Image size: w17.5cm x h18cm Mounted size: w29.6cm x h31cm This tiny church at Lullington on the South Downs is thought to be the smallest in England. It was built from the remains of the chancel of an earlier church destroyed by fire around the time of the English Civil War. My version is inspired by the bold use of black and white seen in wood engravings with textures, patterns and delicate marks used to conjure light and form. SOLD OUT Linocut printed on imitation Japanese paper, edition of 50. 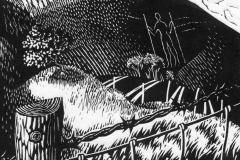 Image size: w17.5cm x h18cm Mounted size: w29.6cm x h31cm A much loved chalk hill figure on the South Downs who has been depicted by scores of artists down the years. This is my portrait of him. £60 Collagraph and woodcut on Fabriano Artistico paper, edition of 8 Image size: w36.5cm x h44cm Unmounted – will be sent in a tube. 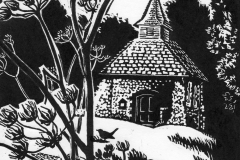 The Lewes Printmakers 6th book about Lewes is entitled ‘Railway Land’ and contains artwork inspired by this local nature reserve and public open space. ‘Leighside’, a grand Victorian dwelling, once stood in the now wooded area of this land. Built by Burwood Godlee, a prominent Lewes figure, it was sadly demolished in 1947 due to continual flooding of the cellars. A footprint of slightly higher ground is all that remains today.